The ciborium in the abbey at San Miniato al Monte in Florence has been restored in time for the 1,000-year anniversary of the abbey’s founding. The ciborium – a covered altar with four columns and an intricate arched ceiling – was completed in 1448 at the request of Piero de’ Medici and designed by architect and sculptor Michelozzo di Bartolomeo. It was built to hold the crucifix of Saint John Gualbert, which was moved to a different church in Florence in 1671. Newly restored features of the ciborium include marble inlays, a painting of The Passion of Christ by Agnolo Gaddi (1394-96), and two bronze eagles sculpted by Luca della Robbia and Maso di Bartolomeo. The project was funded by Friends of Florence, a nonprofit group dedicated to preserving the city’s heritage. 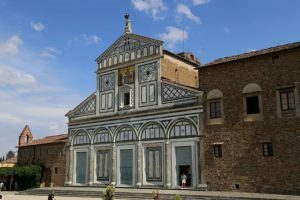 The organization’s president, Simonetta Brandolini d’Adda, called San Miniato a place “of peace, teaching and reflection” and “a symbol for all the citizens of the world,” according to The Florentine. A team of restorers, including people from companies FaberRestauro and Habilis, carried out the project. The basilica’s 1,000-year anniversary celebrations in Florence will continue through April 2019 and include more than 50 events.